When it comes to haunted objects, nothing tops the eeriness of haunted paintings. Some have been accused of burning houses, breaking relationships, and even driving their owners crazy after they felt painted eyes follow them or bore deep into their souls. If you’re shaking your head in disbelief, here are three hair-raising stories of paintings that made their owners’ lives a living hell. 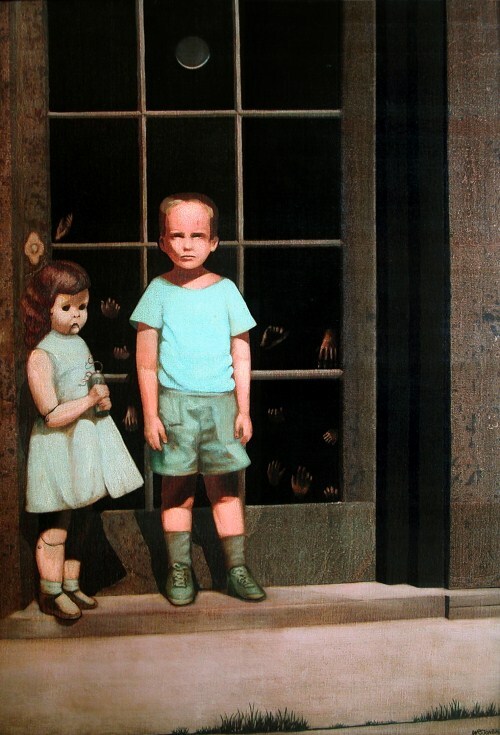 Often called the Most Haunted Painting in the World, ‘The Hands Resist Him’ (above) portrays artist Bill Stoneham at the age of five with a doll whom he believes is his guide through the memories and echoes of life within the Chicago apartment he grew up in. However, changing the hues of the image produces a sinister image altogether. The painting has an equally scary history. Within a few years of its completion, the gallery owner who contracted it as well as its first buyer were dead. The next owners of the painting reported paranormal activities after hanging it up, including seeing the figures in the painting move or disappear from the canvas altogether. The couple even reported dreaming about the boy, infants crying in the painting’s presence, and friends complaining about being tickled lightly by unseen hands. Stressed by these occurrences, the owners got rid of the painting. For 26 years, ‘The Hands Resist Him’ was part of a California brewery. The painting was sold for $1,025 to Perception Gallery in Grand Rapids, Michigan. Nothing has been reported since. 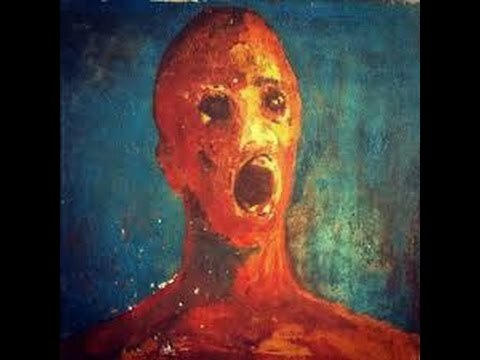 Before reaching Sean Robinson’s hands, ‘The Anguished Man’ was locked in his grandmother’s attic for 25 years. According to her, the photo was haunted by the artist after he used his own blood to paint it and then committed suicide. The old woman would hear voices and cries from her attic on a regular basis. She even told everyone that she saw a man’s shadow in her house and felt the artist’s presence. After her death, Sean took the painting home. It wasn’t long before he too experienced the same strange activity his grandmother complained about for years. His family members were subjected to even worse incidents. His wife felt a hand stroking her hair while his son claimed that a presence pushed him down the stairs. You can watch Sean’s YouTube videos proving the paranormal activities caused by the picture. Artist Laura P. created a painting based on a paranormal photo clicked by James Kidd. 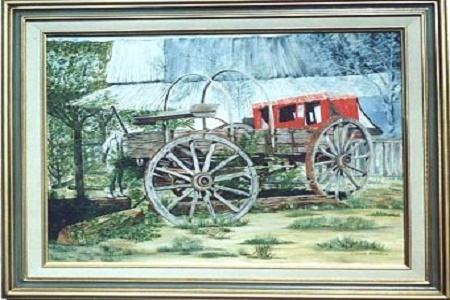 Kidd’s picture of a stagecraft has a surprising element: a head-less figure perched on the left of the wagon. Once she was done with the painting, she felt uneasy as to why she chose this theme. Her unease escalated when the local business she hung it at told her to remove the painting as workers claimed the painting moved on its own, caused a few papers to go missing, and made everyone uncomfortable. Deciding to keep the painting with her, Laura put it up in her new home. However, small strange occurrences happened for many years after, all of which involved the painting or happened close to it. A friend who didn’t believe Laura’s story laughed at the canvas only to wake up at night to the crash of an old clock that had been on the wall securely for 40 years. Another friend clicked a picture of the painting only to see a white, hazy figure missing its head at his home. 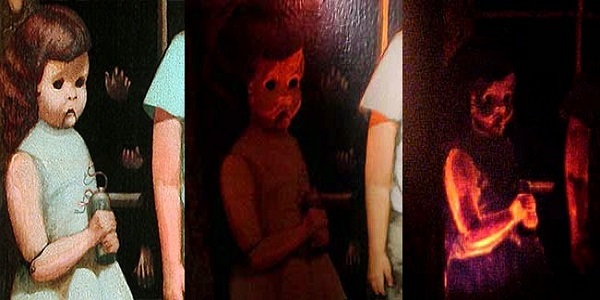 So, if you’re an art lover, make sure to find out about each piece’s history or else you’ll end up as a cautionary tale like the owners of these three haunted paintings.